You've probably heard real estate people refer top a house as having "good bones." The same can be said for closets. When we talk about building a quality custom closet system that will last the test of time, it can be said that there is a skeleton in every closet. Every successful custom closet is built around a basic frame that was thoroughly planned in advance. This planning stage should never be skipped or given a short cut. It is this thoughtfully designed framework that makes the space work for it's owner and hold up over time. If you happened to make a study of custom closet designs, you will find that there are certain basic components (or bones) shared by every successful closet, no matter the size of the project. Think of these essential components like "Legos" that can be arranged and assembled into an endless arrangements to suit many different needs and wardrobes. The best custom closets are always built around these four essential building blocks or "bones." 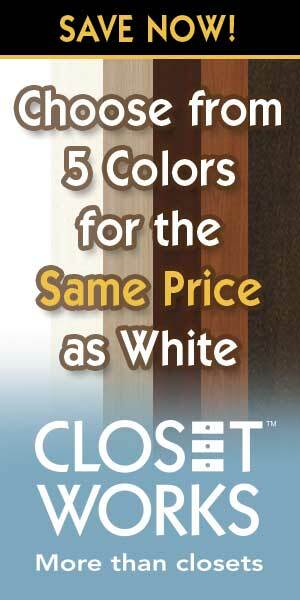 In the art of closet design, there are four basic building blocks that are essential for a closet to be built. These building blocks make up the "skeleton" of every closet. Each of the building blocks can be ﬂoor-based, or suspended on the wall and come in a variety of depths and colors. These all have speciﬁc design guidelines that need to be adhered to for maximum storage, accessibility, and functionality. Choose a height for your closet first and base all of your components off of this height. The standard height for custom closets is 84 inches. This height will keep everything accessible for the average person. Closets can be built higher if you have vaulted or high ceilings, but plan for some sort of assisting device, like a step ladder, to access items stored on upper shelves and rods if you go much over 84 inches height. 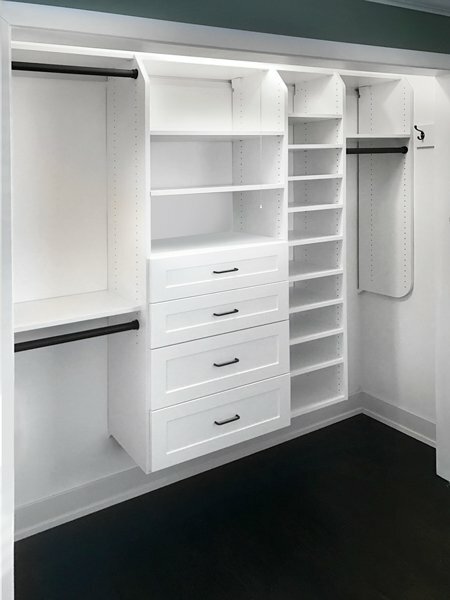 The back bone of all successful custom closet design is based off of these four essential building blocks: double-hang, long-hang, shelving, and half & half closet sections. This custom closet design shows examples of all four building blocks of successful closet design. There are double-hang sections of 48 inches width, a smaller long-hang section, 36 inch wide shelving sections for shoes, and a 48 inch wide half and half section of shelving with a closet rod. Standard closets that come with most new homes usually include a single closet rod with a shelf or two above. This configuration can be thought of as all long-hang, because it will accommodate your longest garments without letting them drag on the floor. However, most people do not need a lot of long-hang space in their closets because their wardrobes primarily consist of two-piece or shorter items. Long-hang and medium-hang closet sections are essentailly the same thing, the ony difference is the number of shelves used above. You can have more shelves above a medium-hang closet section than long-hang. Clothes that require a long-hang section are generally fairly heavy. Design long-hang sections at 36 inches width or smaller to ensure the structural integrity of the closet and prevent any chance of collapse. Allow 62-65 inches of vertical height, depending on how tall you are, for garments stored in the long-hang section. Add one or two shelves above to bring the total height needed for the long-hang section to 84 inches or your selected closet height. Use long-hang for dresses, gowns, robes, coats, jumpsuits. 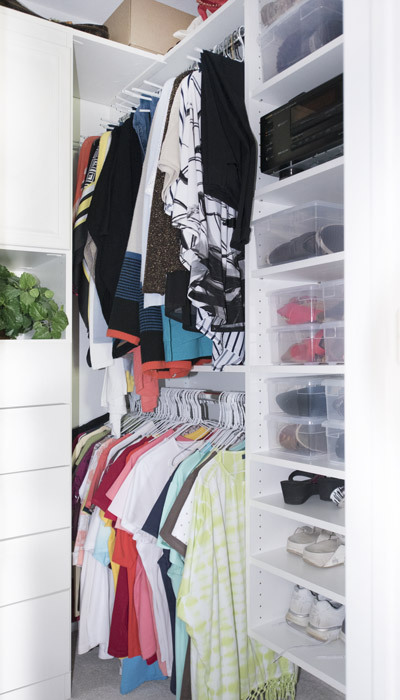 Long items should be considered first when planning the closet. Always allow enough room for long hang. Shorter items can be hung in a long hang section but the reverse is not true. If long items are used less frequently, they can be hung in a corner, behind a door or other less accessible place. If the closet is shared, one long-hang section may work for both people. If there are only a few long items, combine them with medium-hang in one section. By double-hang, we mean areas of the closet where one rod is hung above another, essentially doubling your hanging space. Design double-hang sections no wider than 42 inches. Designing wider sections than 42" could jeopardize the structural integrity of the closet system. The height needed for each of the two hanging sections is also 42 inches, bringing the total space needed for this component to 42" W x 84" H. How many double-hang sections your closet will need will depend on your wardrobe. You can add shelves above the double hang if you have very high ceilings to deal with and have selected a greater height for your closet. Use double-hang for suits, shirts, blouses, folded slacks, skirts, jackets, tops, vests. Hanging space will be increased by hanging short items above short items. Twice the number of garments can be stored in the same amount of space. The shortest items (i.e. folded slacks, shorts, vests, mini-skirts) should be placed on the top rod. Narrower clothing such as folded pants, skirts and vests should go in the top section so the bottom section is not shaded. In general, garments with shoulders should go on the bottom rod because they hang out farther. Each shelving section typically contains seven to ten shelves for a standard 84 inch closet. More shelves my be included if using a taller closet system for a space with higher ceilings. Additional shelves may also be needed if the shelves are intended for use as shoe storage. All shelves should have a designated purpose. For example two sweaters can fit side by side on a 30 inch wide shelf. This shelf can also hold four pairs of women's shoes, or three pairs of men's shoes. Shelving sections should be designed using one of the standard drawer widths whenever possible. Standard widths for shelving sections are 18 inches, 24 inches or 30 inches. Using standard sizes will allow you to switch to drawers or pull-out baskets if your needs change over time. Use shelving sections for shoes, folded garments, hats, purses. Shelves must have a purpose. Use standard width shelves (18", 24" 30") whenever possible. Items stored on shelves are easily visible and accessible. Shelves are less expensive than drawers and baskets and provide many of the same functions. Half and half is typically three shelves over a hanging section when the closet is a standard 84 inches high. More shelves can be used if the closet system is taller than average. This type of section is useful for balancing out the varied storage needs inside the closet. Plan on sections that are no more than 48 inches wide so that you can switch this area to double-hang in the future if your needs change. If you want to use drawers in combination with your shelves, plan on even narrower sections that meet the guidelines for shelving sections outlined above. Use half and half for folded garments, hats, purses, pants, shirts, jackets, tops, vests. Combines short hang and shelving. When shelves and hanging are in the same section, the shelves usually go on top. When drawers and hanging are in the same section, the drawers always go on the bottom. Items that aren't used as frequently should be placed on higher shelving. Doors can be added to cover shelves for a cleaner look. Successfully designing and building a closet requires more than just the ability to mount a clothes rod. Before tackling a new custom closet, it is important to do your homework. Start by plotting everything out on paper. Successful closet design depends on this advance planning. You must consider everything you currently need to store in the space, plus allow room to grow. The basic building blocks of closet design include long-hang, double-hang, shelving, plus half & half. Long-hang and medium-hang sections should be no more than 36 inches wide and 63-65 inches tall. Double-hang or half and half sections should be no more than 42 inches wide. Keep shelving widths to a standard drawer width of 18, 24 or 30 inches whenever possible to include flexibily and the ability to replace some shelves with drawers or pull-outs in the future. If you are on a budget, shelves are cheaper than drawers while providing many of the same functions. Drawers can always be added later if you adhere to recommended sizes. Add doors over some shelving sections for a cleaner, more custom look. By following a few basic guidelines and combining the four basic building blocks of closet design into your own custom configuration, your chances for building a successful custom closet will be greatly increased. This custom closet exemplifies three of the basic building blocks of custom closet design. It shows a double hang section, a long-hang section, and shelving sections. One of the shelving sections has drawers installed on the bottom, which is a nice option for small articles of clothing such as lingerie. 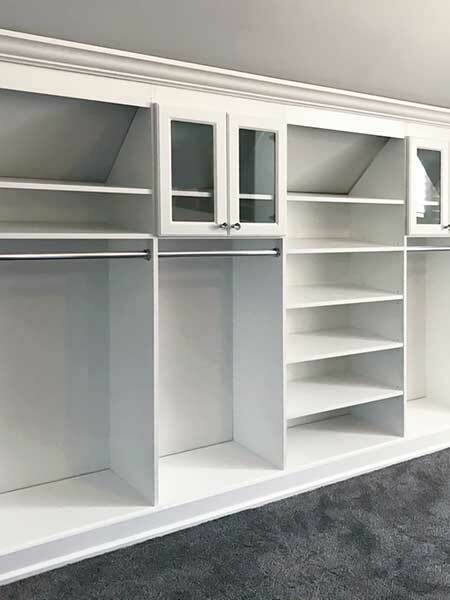 Notice how this custom closet design uses cabinet doors over the shelves in the half and half section. Doors add an elegant touch while offering the ability to camoflouge some of the owner's possessions. The entire look is neat and well organized. 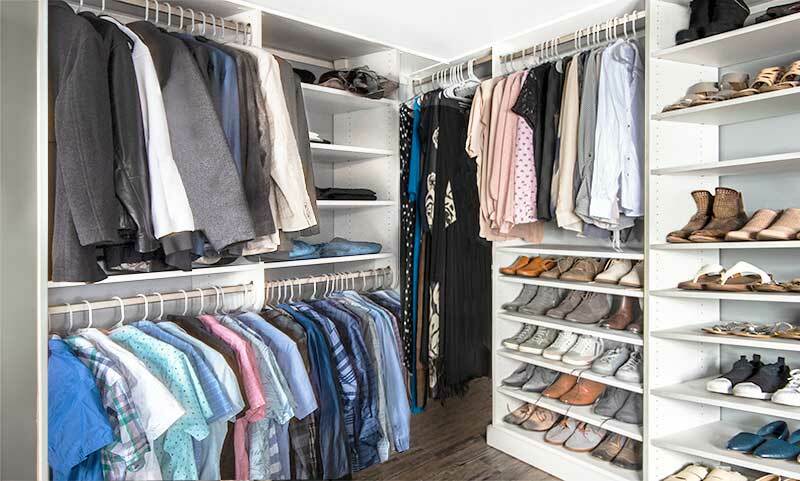 This closet with an exceptionally high ceiling takes advantage of every inch of space. It accomplishes his by using the same essentail building blocks as a closet with an 8 foot high ceiling, but it adds additional shelves above the standard closet sections. A rolling ladder was added for access to the items stored on the upper shelves. 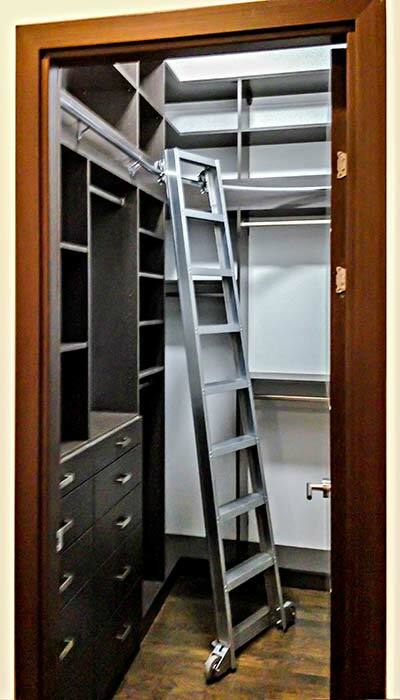 This closet demonstrates that even the smallest closets use the same essential building blocks as larger, walk in closets. Note the 24 inch W shelving section next to the 48 inch W double hang section.